Define your beautiful eyes with Blue Heaven Soft Kajal Eyeliner, It provides the desired intense lines with even smooth application. It is a retractable pencil with high intensity of colour that define your eyes as well as your look . It comes with a detachable sharpener. Additional Information : Blue Heavens cosmetic is a premium cosmetic brand of India that offers quality products at affordable rates. Mr.Charanjit Singh and Mr. Gurnam Singh started the Blue Heaven journey in 1974 and have never looked back since. Already a leader in the mass segment, This cosmetic brand is standing its ground with constant innovation. Explore the entire range of Eyeliner available on Nykaa. 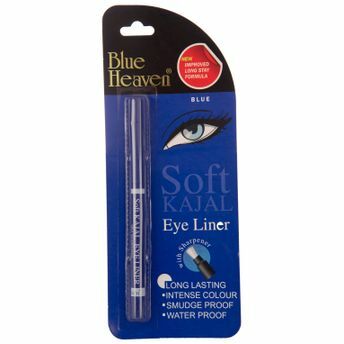 Shop more Blue Heaven products here.You can browse through the complete world of Blue Heaven Eyeliner .Alternatively, you can also find many more products from the Blue Heaven Soft Kajal Eyeliner range.